Summary: Enjoyable but not memorable. After finding success in professional music at 22 in 1989, British rock prodigy Gary Hughes eventually launched TEN in 1996 and released their fifth album, Babylon, in 2000, the second release on the Frontiers label. 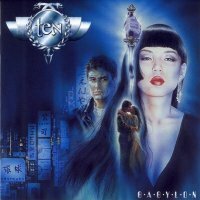 According to the liner notes, Babylon is about a computer programmer's tragic love affair in a fictitious futuristic setting. As a consequence of Babylon taking the form of a concept album, you have the enigmatic accent of Gavin Fernie as the voice of a radio newscaster narrating the story through a series of reports between the songs. Even if you like concept albums like Operation:Mindcrime by Queensryche, you'll find the execution here to be contrived and cheesy. Furthermore, all of the songs seem unnecessarily long; they aren't in order to build a sense of anticipation. There are just too many repeated phrasings--the whole CD is nearly an hour long with just ten tracks. Then, due to Hughes' uncharacteristically low vocal octave range, it seems that, perhaps Audu Obaje, mix engineer for Babylon, had to rely on upper mid-range EQ boosts so that the lyrics could even be audible. The strangest aberration on this recording is the blatant timing problems on the opening track, "The Stranger." perhaps a side effect of Greg Morgan tracking his drum sessions in Manchester, Great Britain while the rest of the takes were taped in Oldham and Rossall. That's especially bad news because it's easily one of the best songs on the disc. All that said, there is a lot to like here. The work of legendary rock keyboard synthesizer player Don Airey (Jethro Tull, Ozzy Osbourne, Whitesnake, Bruce Dickinson of Iron Maiden, Deep Purple, Judas Priest) is featured on Babylon. If you like the kind of guitar solos usually found in most Dio albums, you'll enjoy the stuff Vinny Burns and John Halliwell came up with for this album. Finally, years after American rock records completely destroyed dynamic range by "slamming the zeros" on the mixing console during mastering and having totally inaudible drums, you have great percussion tone throughout the whole album, complimenting the excellent guitar work. As for specific tracks, there are some clear winners here. While over 5 1/2 minutes, the most radio friendly track on this album is "Black Hearted Woman." It's got a catchy signature melody and catchy lyrics--it's fun to sing along with this one. The heaviest track is Thunder in Heaven but clocking in at nearly seven minutes with very few thematic elements, it just seems long after a while. Speaking of Queensryche, if you like their music then I think you would like "The Heat," the 5th track on the album. If you like Night Ranger, you'll like "Give In This Time." My favorite tracks on this album are "Timeless" and "Barricade." About Barricade, this song was, unfortunately, almost ruined by the fact that the second verse is far too busy. It starts out perfectly with a killer guitar hook but then along comes the oft-repeated main guitar riff for the whole song on top of it, and Hughes' vocals. There's just too much going on here. Compared to everything else being released, particularly in the United States at the time--the year 2000--this album is a clear cut above what was in the Top 40 then. However, among all Melodic Rock releases between the end of the 1990s and the early part of the new millennium, it probably would have also stood out from the crop of AOR releases then as well had Frontiers brought in a producer to trim track lengths, tighten up production and perhaps drop tracks 6 and 10 altogether.